What does it mean to be depressed? Eating habits change? Sleeping habits change? Suicidal thoughts emerge? Fatigue sets in? For how long? When are these behaviors manipulative, or unconsciously intended to embrace the sick role? When is intervention necessary and for how long? Should that consist of psychotherapy and/or medication? Who makes the diagnosis, and after what kind of exploration? Where does family history fall into this assessment? Whose point of view should we consider? The patient, the significant other, or another professional? Then, we move on to the severity indication. Is it mild, moderate or severe? Says who? Does this relate to impairment of functioning or does this relate to the depth of despair? I confess that after over a quarter of a century in this field, the issue of mood baffles me deeply. Moods are interesting to identify, are worthy of psychological exploration, and sometimes psychotropic medication, but the defining issue resides with the patient, not the physician. The physician is a concerned observer while the patient expresses concern over his mental outlook. There is no timetable for treatment, as Joe Biden described there is no timetable for grief either. There is only a nonlinear journey of psychological pain. As humans, this pain is alleviated by human contact which comprises curiosity and openness to hearing the internal world. Joining together in pain is helpful, at least as a beginning to treatment. Understanding that a journey lies ahead in which there will be a “pal,” a concerned professional, minimizes the suffering of feeling painfully alone and scared. From there, decisions can be made about further treatment including medication and neuromodulation. Placing constraints on the intervention defeats the purpose. It is the open-ended approach which provides security. The philosophy that “I do not know where we are going or how long it will take to get there, but I am happy to accompany you,” is, and should be the major tenet of psychotherapy. I repeat this notion because manual-based psychotherapies take this point away. In other words, by their very nature, they are not therapeutic for those who are frightened about how they feel. The rant continues. 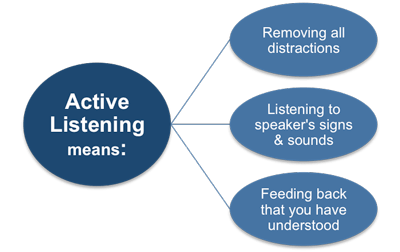 Why am I harping on the value of listening? For one thing, I find myself irritated when I get interrupted. Similarly, when someone has the patience to let me finish my thought, I have gratitude and calmness. My ideas, the way I construct my sentences, what I choose to say and to whom I choose to say it to, are all ways in which I define myself. I need a caring ear for me to examine my way of thinking, to hear what I say and tell me what it feels like to hear what I am saying. This is particularly true in times of great confusion and uncertainty. Few people, in my experience, can tolerate me finishing my thoughts. So often, I observe that in the middle of my idea, the subject subtly changes and I am left feeling like I could not finish my experience. I observe this witnessing other conversations, as well. Person A talks to Person B and as time goes on, maybe 1 minute, maybe 5 minutes, the conversation turns to something that Person B is more interested in talking about. Yes, there needs to be mutuality in relationships, and Person B should have the opportunity to talk to Person A, but at what point should the conversation shift? Everyone has to cope with being cut off, with people losing interest in their stories, with the inevitable self-centered pivot of Person B. Yet, in times of psychic pain, that shift can be intolerable because Person A wants to examine their thinking, their fantasies, their ideas in the context of an important Person B. When Person B can be there for Person A in this way intimacy ensues. I would venture to say that we all need people to hear our stories, no matter how trivial they may be. Now, let’s imagine that Person A feels disappointed by Person B and Person A feels there is nowhere to turn. Psychotherapy can serve as this bridge for Person A to either help Person B be a better listener, or find Person C to help her through her life’s journey. Person A may also benefit from psychopharmacology and Person A may also benefit from socialization and mindfulness, but what can really help Person A is the opportunity to examine how she thinks. This requires a skilled listener. Examining how she thinks, Person A can then come to learn how she carries forward beliefs from her past which interfere with her ability to connect with Person B so that Person B can be a good partner for her. These are the elements of in-depth psychotherapy. It is low-tech, but it is high-impact. As humans, we depend on other humans for growth and development. Technology is not going to change that. I worry that patients are over-medicated. I worry that psychiatrists are no longer interested in psychotherapy. I worry that the reductionistic model of most evidence-based practices, takes away from embracing the complexity of the human mind. I worry that I won’t have colleagues to pass down my patients as the residency training is so different, and in my mind, more limiting than it ever has been. I worry that patients will see themselves as “sick” as opposed to the author of their own existence. I worry that the central theme of self-sabotage will be lost when patients seek the medical model of wanting a pill to end their suffering. I worry that medications, although very useful, will change the empowerment of the individual from active to passive. I worry that antipsychotic medications are too often used for behavioral control, furthering the idea that the patient is “sick” as opposed to helping a patient see how they can get well by changing their interface with the world. I worry that children, with well meaning parents, will come to see themselves as handicapped, when, in fact, their issues have to do with separating from their parents. I enjoy prescribing medication and facilitating the relief of suffering, but to an extreme, this becomes me carrying them through the illness, with little work on the patient’s part. Most of the time, the patient needs to do the bulk of the work, trying to understand how he gets in his own way. By understanding this, he can move forward with a new approach to his world. This is transformative change, so much more meaningful than symptomatic relief. Again, symptomatic relief is important, but only as a first step towards a deeper understanding of their trauma and their subsequent preconceived negative feelings that they place on their world. Mental schemas, or scripts, often get in the way of new experiences, which often come in the form of new relationships within both old and new connections. Improving these connections leads to life satisfaction and fulfillment. That is not complicated. Getting there is the challenge. Psychiatrists, if we are to save my field, need to want to help people towards deeper experiences with themselves and others. If we give that up, we will enact the very problem we aim to solve. We will get in our own way. ICD-10 has arrived, October 1, 2015, changing our charting system, creating a much more detailed diagnostic system. Instead of saying, for example, that a patient has “polysubstance abuse,” I need to say they have “cocaine use disorder-severe, alcohol use disorder-severe, cannabis use disorder-severe, Tobacco use disorder-severe,” etc. Theoretically this new diagnostic system will create a more accurate database in which to do research studies on disease trends. I am excited by that prospect, but at the same time, this added detail adds inaccuracies. In the case of substance abuse, it is more accurate to say “polysubstance abuse,” as most drug addicts use a variety of drugs at different times during their years of addiction, and so to write each drug separately does not convey the narrative of their journey from prescription opiates to street heroin and back to prescription drugs. In general, more specificity is helpful, but people are not robots and being specific can come at the price of the nuances in their history. I return to the major thrust of this blog. The history remains the most important part of psychiatry and now with ICD-10, there will be more focus on a reductive approach to diagnosis and treatment. The narrative gets lost for the sake of big data. For other areas of medicine, where there are objective findings, more specificity makes sense. For psychiatry, it will be garbage in, garbage out, as computer programmers like to say. ICD-10 has a broad reach, and as such, psychiatry should not be included in this wide net. Our field remains in its infancy. We are not ready for the adult table. Once again, I think we should be honest about that.